These past few weeks has been pretty exciting for elite sport up in Queensland and SABEL Labs. First up Chris and the S&C boys at the QAS have just installed a state of the art video based lifting system in the gym. When I say video its actually a distancing video system (like Xbox Kinect uses and then some). Its called Elite Form http://www.eliteform.com/ and used in some of the professional leagues in the states. Thus lifting in the gym is recorded in a paperless way as the athlete moves from station to station. Not only are the weights and the number of lifts recorded, but so too is the rate of the lift. This gives all kinds of information on the quality of the lift which can only be a good thing. Find out more about the system here. As a researcher its been exciting to see the technology move from an idea first seen at an SPIE conference back in 2006 to exploiting the off-the-shelf Kinect system for game based analysis (See Simons paper ), to now being a pervasive and u obtrusive system in a Gym. Later we presented our wearable illegal arm action technology at the Cricket Australia Science, Coaching and Medicine conference at the newly established National Cricket Centre at Albion, along with Jono and Mitch. It was veritable who’s who of the coaching and high-performance cricket in Australia with a liberal sprinkling of current and past cricket players it was an exciting opportunity to give an update on our world with the ICC in the past few years. Luckily we know our googly from our doosra! 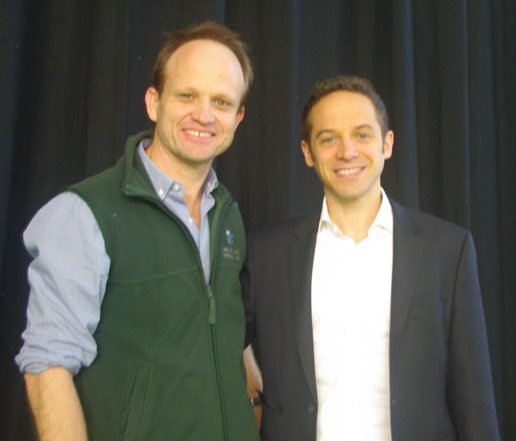 A keynote at the conference was David Epstein, author of ‘The Sports Gene’ (http://thesportsgene.com) who treated us to his take on the 10, 000 hours to proficiency that is much (mis)used in the popular press. See his TED talk here. David takes a more biological approach as he looks at the nature vs. nurture arguments among other things. Turning out he’s a training partner of Outliers’, Malcolm Gladwell (another author who has looked at 10,000 hours). I had the opportunity to have a chat with David over lunch about his work, career and the lively dialogue he shares with Malcolm. David was until recently a regular writer for sports illustrated (there goes my opportunity to buy the magazine for professional reasons). All in all its sad to have to head back to the lab…but a most illuminating week or so!